Towards Maturity’s benchmarking program has found that, while 98% of L&D professionals want their Leadership programs to deliver improved business performance, only 18% are managing to achieve it. This begs the question of why so many are trying, and failing, to produce business leaders, what are the barriers to achieving this worthy goal, and how we can do better as an industry. If we add to this that 95% want to improve career planning, with only 13% consistently achieving it, and 95% wanting to improve succession planning with only a 16% success rate, we find our concerns reinforced. 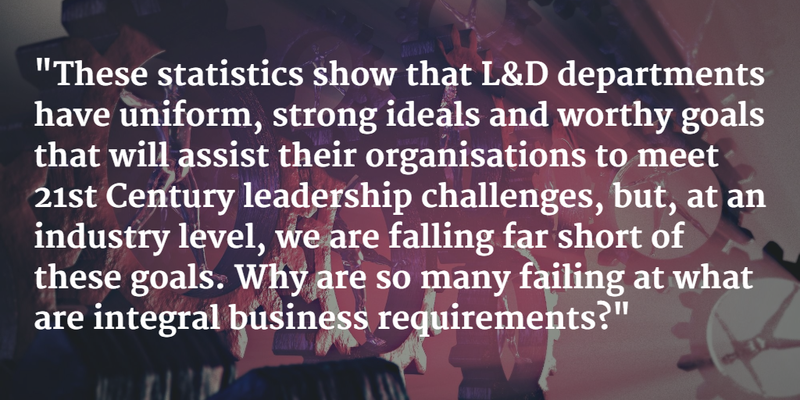 These statistics show that L&D departments have uniform, strong ideals and worthy goals that will assist their organisations to meet 21st Century leadership challenges, but, at an industry level, we are falling far short of these goals. 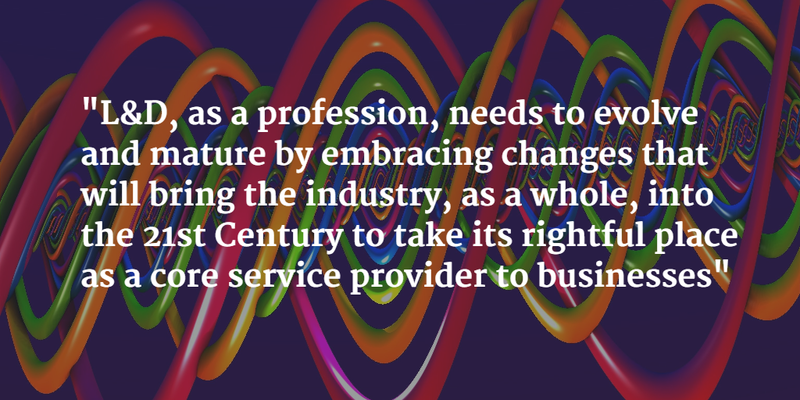 Why are so many failing at what are integral business requirements? Unfortunately there is a large gap between what L&D departments are providing and what senior managers and leaders need and want from their professional development. For example, the report cites something as basic as the format that learning is presented in: 92% of Leadership programs focus on face to face learning, which, while being supported by 40% of learners as integral, is also not the way most leaders want to be trained, indeed only 60% of leaders have found face to face training at all useful, while a staggering 80% of learners want to learn at their own pace which is diametrically opposed to classroom face to face training. The fact is that leaders are highly self-directed learners, they require guidance and foundation, but they also require more modern resources that will help them to learn and develop themselves. Indeed, 70%, would prefer mobile content as they learn while commuting, however only 39% of L&D teams offer this as an option. 70% of leaders who participated in Benchmarking listed Google and other search engines as essential to learning, which means there is a large gap between what is being provided and what is required. L&D needs to step up. One of the problems is that Leadership programmes are woefully behind the times: despite 91% of leaders finding collaboration with others essential or very useful, 55% being motivated by networking technologies, 40% belonging to networks and communities, and 40% of Leaders already utilising social media for learning, not all L&D departments are on board, in fact 30% of L&D leaders have no plan to implement social learning, which would clearly bring great value to their Leadership Programmes. The fact is that Leaders are busy, they are used to having information and learning tools whenever and wherever they require them, and as Leaders, are highly adept at networking and obtaining information from those around them. Being able to connect and network to gain ideas and best practice is second nature, so why are L&D departments not providing these basic building blocks to success within their organisations? 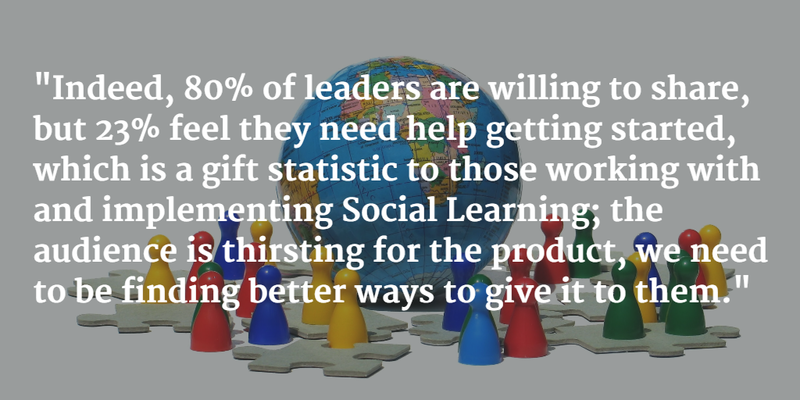 Indeed, 80% of leaders are willing to share, but 23% feel they need help getting started, which is a gift statistic to those working with and implementing Social Learning; the audience is thirsting for the product, we need to be finding better ways to give it to them. Resources are not a barrier here: 25% of overall L&D budgets are assigned to Leadership programs, and 14% is allocated to Learning Technologies. In fact the barriers here are the barriers that L&D professionals should be intimately acquainted with; skills shortages, disengagement from business strategy, and a lack of calculating business focused ROI. Firstly, 68% of L&D leaders just don’t have the skills and knowledge themselves to adapt today’s technologies to leadership development programs, while 56% don’t see implementing technology enabled learning as a priority, and 49% are reluctant to adopt innovative learning practices. This means that programmes are starved of access to new technologies that could drive success in Leadership Programmes, micro-learning, social learning and gamification are three areas that could engage and promote learning at the highest levels, and that should be included in any comprehensive leadership program, because they not only make content accessible, they engage on both the social and competitive edge that leaders are well known to flourish within. The second barrier is that L&D professionals are not creating their Leadership Programmes in context with business challenges and strategy, indeed they are creating their content in a bubble. Only 31% include users in their programme’s design, and while 90% are aware of the 70:20:10 model, only 25% are actively using the framework to support contextualised learning and only 26% are using communities of practice in leadership development. Finally, there is little commitment to tracking progress: while only 41% identify KPIs for leadership learning, a meagre 20% measure business KPIs, only 31% track the application of learning from the learners’ perspective, while a scant 7% seek evidence of this from their managers, and only 19% use learning analytics. Just looking at the characteristics of high achievers shows the potential for L&D as an industry. When designing, high achievers use competency frameworks and diagnostic tools, they link performance to management objectives, offer accreditation and involve leaders in the design process. Successful programme delivery uses a wider blend of methods in formal training, creates engaging online experiences that utilise mobile devices, and develops bespoke mobile apps for learning, using games and simulations as well as self-study lessons. These programmes also go beyond what is produced internally, curating external resources, providing access to external portals and MOOCs. Successful programs implement Social Learning, exploiting external social networks in their learning design, implementing learning communities and leveraging in-house social media to create spaces where leaders can network and share. 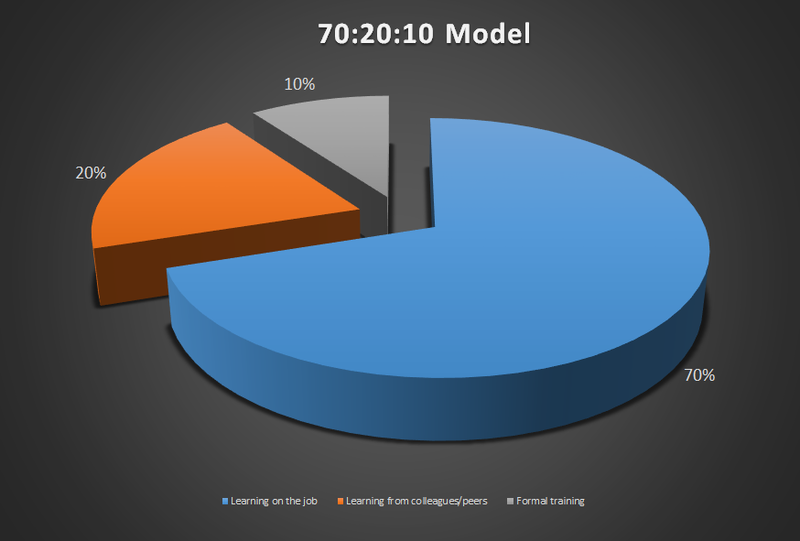 These programs also bring learning into the work space, employing experiential learning by supporting learning in the context of workflow, implementing models such as 70:20:10, and taking advantage of mentoring, work shadowing and job assignments. Furthermore, successful L&D departments engage with key stakeholders and provide job aids to support learners in their application of what they have learned. Lastly, these programs demonstrate their value by focusing on business outcomes, identifying business KPIs in partnership with senior management and monitor and report on progress against their KPIs. Many of the themes put forward in this report reflect this blog’s position that there is a crisis of credibility in Learning and Development because the profession is no longer aligned closely enough with what learners need and want in the form of delivery method, that L&D departments are not in synch with their organisation’s business strategy, and that these departments are not generating and providing evidence through metrics that can analyse and support the extent to which their programmes are a success. The good news is, this can change and we know how to do it. L&D, as a profession, needs to evolve and mature by embracing changes that will bring the industry as a whole into the 21st Century to take its rightful place as a core service provider to businesses looking to not only survive, but succeed in the brave new world of a globalised competitive knowledge economy that is being handed down from the Boomer generation to Gen X and Millennials. This entry was posted in Training Theory and tagged analysis, best practice, contextualised learning, credibility, crisis, crisis of credibility, development, effective, employee, employee development, employee training, face to face, gamification, implementation, knowledge, KPI, KPIs, leadership, learning, learning and development, manage, mentoring, micro-learning, Millennials, motivation, needs, new employee training, online, Participation, professional, programmes, ROI, skills, skills shortage, Social, Social Learning, statistics, training, training and development, unsuccessful. Bookmark the permalink.